With the world in turmoil, the greatest challenge facing us today, says Mario Betti, is the inner transformation of our entire being. 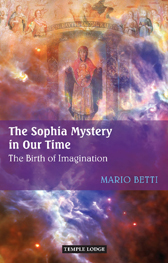 This rebirth from within heralds a new form of consciousness - a creative imaginative faculty - that is simultaneously a reawakening of the mysterious Sophia, the feminine aspect of the Divinity. Imagination allows us to behold the spiritual forces actively at work in the world, resulting in the possibility of a comprehensive rebirth and renewal of culture. MARIO BETTI was born in 1942 in Lucca, Italy. After studying and working in Italy, Spain, Switzerland and England, he moved to Germany. He taught for many years at a Waldorf School, where he became head of art education, and between 1985 and 2001 was a lecturer in educational anthropology, art history and anthroposophy at Alanus University in Alfter, near Bonn. Between 2001 and 2005 he was a lecturer at the Institute for Waldorf Education in Stuttgart. His stories, essays and poems have been published in Italy and Germany.